The Sakthi - IOB Chidambaram Chettiar Memorial Trust was established in 1995 to perpetuate the memory of the Founder of Indian Overseas Bank – Shri M.CT.M.Chidambaram Chettiar. The Trust was formally launched on 9.12.95 by the then Hon’ble Union Minister of State for Finance, Government of India Shri P.Chidambaram. The objective of the Trust is to empower the Women Folk in the lower strata of society through vocational training. 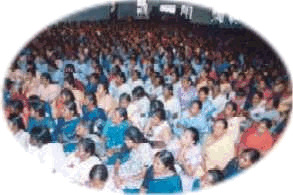 Indian Overseas Bank Management, Indian Overseas Bank Officers Association and All India Overseas Bank Employees’ Union joined together, to serve the noble cause of helping women to acquire vocational skills and thereby embark upon self-employment ventures, so as to enable them to improve their economic status. The Sakthi – I.O.B Chidambaram Chettiar Memorial Trust was established in 1995, with an initial corpus of Rs.5.25 lakhs which has now increased to Rs.21.30 lakhs. Sakthi-I.O.B Trust provides skill based vocational training and entrepreneurial development programme all over India, to Women below poverty line. The Trust imparts Vocational training to women by having a tie-up with other institutions like NGOs, Service organisations and Non profitable Institutions. 12. Preparation of Pheynyl, Dishwashing Powder, soap oil, etc. So far, 1128 women below poverty line were benefited through the skill based vocational training. To create awareness and to groom the entrepreneurial traits of educated unemployed women, our Bank is conducting Entrepreneurship Development Programme for Women under the aegis of Sakthi - IOB Chidambaram Chettiar Memorial Trust since as early 2000. As a way of synthesizing the objectives of IOB-Sampoorna (Village Adoption Scheme) and Sakthi Trust, skill based training programmes for women are being conducted in select IOB Sampoorna Villages and Minority concentrated districts. Some of the Women Entrepreneurs were allowed to exhibit their products for sale during last three days of the program at the training Venue on a trial basis. It was well received by the visitors and the women entrepreneurs were also able to assess the marketability of their products. So far, the training courses under the aegis of Sakthi IOB Trust have benefited 3331 women below poverty line. The Trust continues the pursuit of its objective viz. upliftment of downtrodden women.